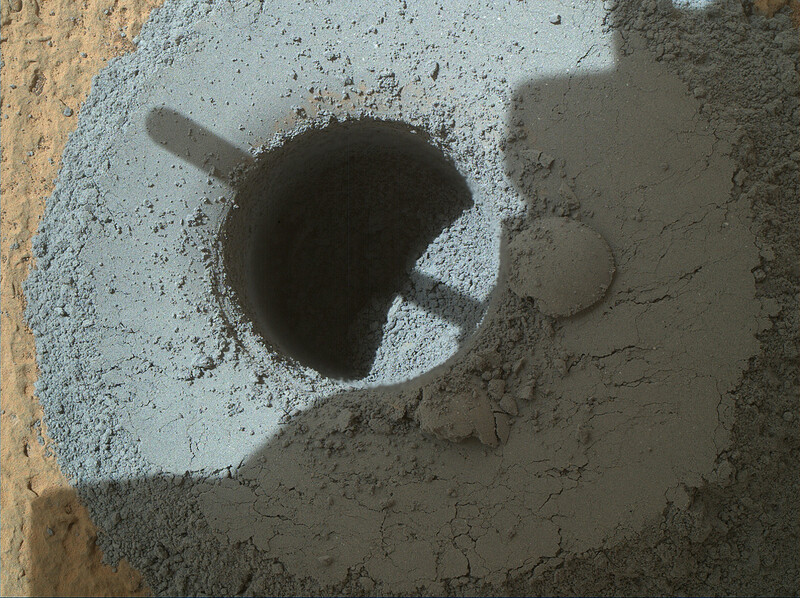 This hole, with a diameter slightly smaller than a U.S. dime, was drilled by NASA’s Curiosity Mars rover into a rock target called “Telegraph Peak.” The rock is located within the basal layer of Mount Sharp. The hole was drilled on February 24, 2015. NASA’s Curiosity Mars rover drilled a small hole on February 24 to collect sample powder from inside a rock target called “Telegraph Peak,” which is located within the basal layer of Mount Sharp. The target sits in the upper portion of “Pahrump Hills,” an outcrop the mission has been investigating for five months. The rover team is planning to drive Curiosity away from Pahrump Hills in coming days, exiting through a narrow valley called “Artist’s Drive,” which will lead the rover along a strategically planned route higher on the basal layer of Mount Sharp. The Telegraph Peak site was selected after the team discussed the large set of physical and chemical measurements acquired throughout the campaign. In particular, measurements of the chemistry of the Telegraph Peak site, using the Alpha Particle X-ray Spectrometer (APXS) on the rover’s arm, motivated selection of this target for drilling before the departure from Pahrump Hills. Curiosity reached the base of Mount Sharp after two years of examining other sites inside Gale Crater and driving toward the mountain at the crater’s center. NASA’s Mars Science Laboratory Project is using Curiosity to assess ancient habitable environments and major changes in Martian environmental conditions. NASA’s Jet Propulsion Laboratory, a division of the California Institute of Technology in Pasadena, built the rover and manages the project for NASA’s Science Mission Directorate in Washington. The rover’s APXS was provided by the Canadian Space Agency. CheMin was developed by NASA Ames Research Center, Moffett Air Force Base, California, and SAM was developed by NASA Goddard Space Flight Center, Greenbelt, Maryland. Be the first to comment on "NASA’s Curiosity Rover Drills at ‘Telegraph Peak’"